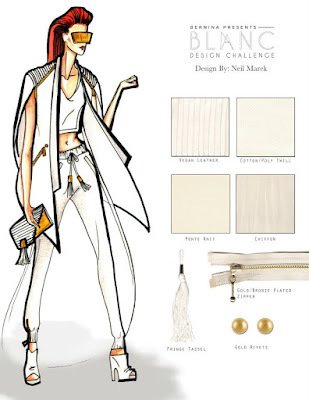 Fashion Design Blog: VOTE FOR NEIL MAREK IN THE BERNINA BLANC DESIGN CHALLENGE! VOTE FOR NEIL MAREK IN THE BERNINA BLANC DESIGN CHALLENGE! Neil Marek, UNT Alumni and Co-owner of Marek+Richard has progressed in the Bernina Blanc Design Challenge and now needs your votes to move on to the final round of the competition! The contest, sponsored by Austin Fashion Week and Bernina Sewing, challenges designers to focus on quality design and construction using an exclusively white palette. The garment, inspired by the Samurai Culture of feudal Japan, features distinct tailoring and detailed textures throughout. 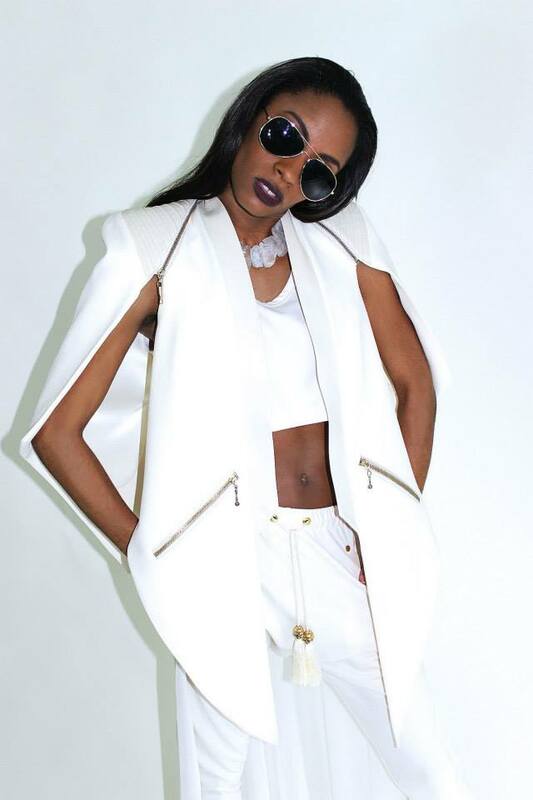 The cape is removable allowing it to convert to a sleeveless blazer. As well, drawing from the clash of hard and soft within the samurai armor, the geometry of the coat is contrasted with softer elements like a chiffon high-low top and a draped ponte trouser jogger. The look also features jewelry and handbag design by Neil Marek. To support Neil in this contest, please vote by clicking the link below. Voting is through Facebook and ends on Thursday, October 22, 2015 at 11:59PM. Thanks for the support.